The Sixties were a time of enormous change, both technologically and socially. The space race was on and the American culture was focused on Sputnik, the Cold War and jet airplanes that were able to transport people faster than ever before. American culture was also focused on a younger generation that was busy rebelling against long-established traditions. This rebellion had a huge impact on fashion, music and home décor. Everything became more dynamic, graphic and colorful. London was also a major influence on design and trends, especially with their most famous export, The Beatles. In 1964 the first discotheque opened in L.A. and quickly caught on across the country. The high-tech metallic and mirrored look of the discos influenced home and office interior design. On the opposite end of the spectrum, the hippie culture with travel to India and Morocco introduced the “ethnic” look. The words “Peace” and “Love” were seen everywhere as both graphic symbols and as a mantra of a generation. Life in the ’60s focused on self-expression and home décor was just the place for people to make their individual statement. Colors were inspired by nature. Green, gold, orange and yellow were very popular and could be found on everything from clothes to home décor, and even cars. Previous eras had similar popular colors, but in the ’60s they were pumped up to vibrant hues. Psychedelic colors played off one another for maximum impact. Combinations such as fuchsia pink and tangerine orange were placed side-by-side. Bright and metallic vinyl wallpapers are used. Contrasts in black-and white were also popular. The desired effect was to create maximum impact for a striking, provocative look. Tie-dye, psychedelic, paisley and floral fabrics were popular. The more colorful the fabrics, the better, seen with larger sized, stylized flowers and brighter colors than ever before. Neon colors created a very modern look. The hippie look consisted of ethnic prints like Indian fabrics made of cotton. Indian saris were used as bedspreads, curtains and wall hangings. Flat pack furniture, “S” and pod-shaped chairs made of space age shapes and materials were the look. Furniture was made of metal, glass, wood and PVC, and sometimes combinations of these. New technologies allowed furniture to be made from molded plastic and formed into organic or space age shapes. A lot of furniture was designed to be disposable and temporary. Open shelving in the Danish style was often used as room separators. Styles were fun and witty overall. Homes were now being built with casual family rooms or dens in addition to having just a formal living room. The TV became the focal point of the family room. TV trays were designed so dinner could be eaten where the family gathered—in front of the television. 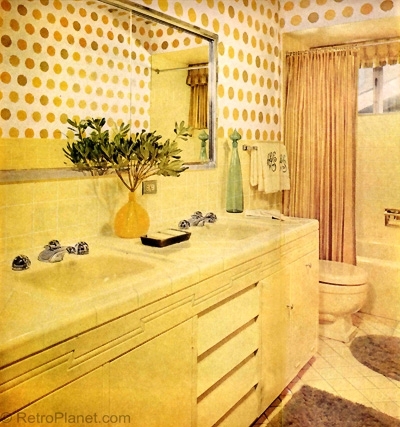 In the 1960s, ethnic decor was popular. 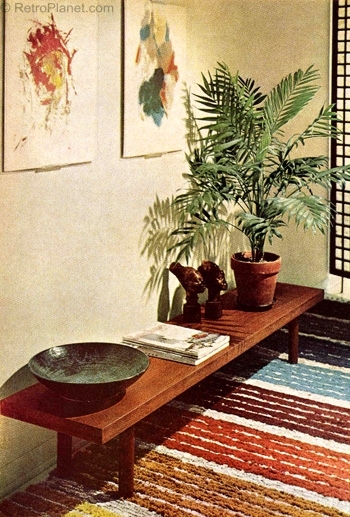 A popular flooring trend of the ’60s was shag rugs. Also, brightly colored textured rugs and rugs made in India and Morocco were trendy. 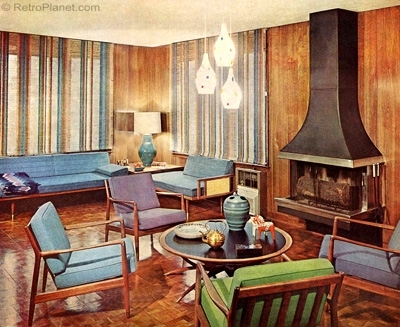 No-wax vinyl floors were coming into vogue, replacing harder to care for linoleum. Popular design elements were Siamese cats, mushrooms, roosters, daisies and owls. Copper and other metals were very popular. Pop art inspired by comic books and popular culture (think Andy Warhol and his “Campbell’s Soup” painting) were great for kitchens, living rooms and family rooms. Modern art with geometric shapes and vibrant colors decorated homes, as well as psychedelic prints and op art. This look was referred to as “Mod”. Posters became an accepted, inexpensive way to decorate, and lighting was exciting with lava lamps and fiber optics. The hippie look created a contrast to the modern techno look, with more muted colors and ethnic patterns. Hanging beads and leather fringe added to the hippie style. 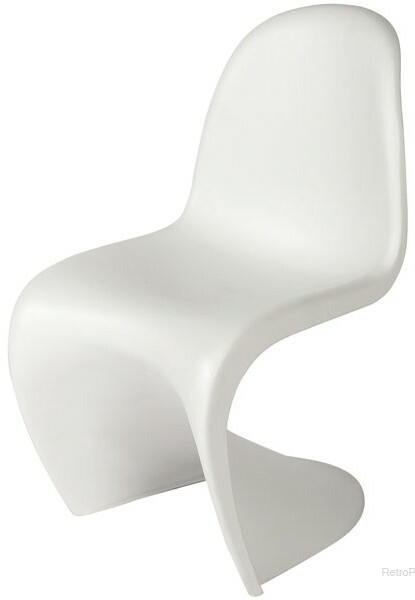 1967 brought us the ultra modern Panton chair. Satellites allowed for transatlantic television, which contributed to Europe’s (especially Great Britain’s) influence on American culture. 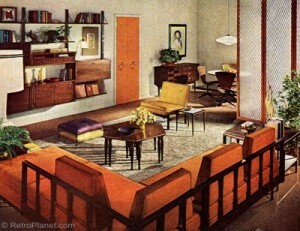 Lucite and colored plastics were used for furniture and home accessories. Tupperware, although having been around since 1946, was in nearly every home and was available in an array of colors. There was an emphasis on entertaining, and a multitude of kitchen appliances were created to make gatherings easier and more comfortable. Some of these appliances included electric coffee pots, electric skillets, toaster ovens and fondue pots. Electric ranges had been around since 1882, but were becoming a lot more popular in kitchens in the 1960s. The overall look of the ’60s was clean and open. Modernism and abstract expressionism began to take hold – the traditional past was rejected and new trends and points of view were celebrated. Most importantly, design became a means of provoking emotion and reaction. Minimalism, as a form of Modernism reduced design to only the most essential elements. In contrast, the “flower power” and Hippie movements were more decorative and ethnic in nature. What’s your favorite element of 1960s design? 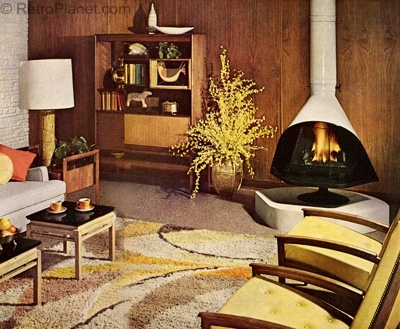 Do you live in a 1960s style home? We’d love to see pictures!